Click the "Show a popup reminder" box on the Actions tab of the Event Editor or Reminders tab of the Task Editor. Click the "Show a popup reminder" box on the "Event Defaults" tab of the Event Calendar Properties window or "Task Defaults" tab of the Task Calendar Properties window. Events and tasks can be set up to display a popup reminder. An example popup reminder is shown below. To enable a popup reminder, check the "Show a popup reminder" box in the list of available actions on the Event Editor or Task Editor window. This will enable the popup reminder options to be viewed or modified as described below. There are two tabs for configuring the popup reminder settings. The "When" tab enables scheduling of when the popup reminder should appear. The "Content" tab enables selection of what the popup reminder should contain. 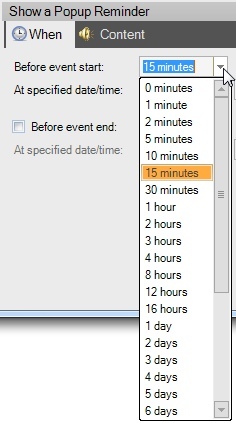 You can specify the amount of time before the event or task that the popup reminder window should be first displayed. The time can be between 0 minutes and 6 months before the event starting time or task due date. The value can be typed in or selected from a drop-down list. When typing in a value, the number must come first, followed by a space and then the unit of time (minutes, hours, days, weeks, or months). Example: "1.5 hours". Enter a negative value to make the reminder appear after the event or task start. For example "-1 hour" will make the reminder appear at 1 hour after the start time. If you prefer to specify an exact date and time for the reminder to appear, you can use these fields. Any changes made here will automatically adjust the "Before event start" value, and vice versa. The values can be selected using the drop-down button or typed in with the keyboard. A secondary reminder can be displayed based on when the event ends or the task is due. For example, if you have an appointment to have your dog groomed, the first reminder would be for dropping your dog off at the groomer and the second reminder would be for picking up your dog later in the day. Rather than defining two events to get two reminders, a single event with starting and ending times could be used. Reminder sharing options will be displayed if the reminder is associated with an event belonging to a calendar that is published or shared over your local network. These options enable you to choose whom should see the reminder. You can also choose to not have the reminder shown to yourself. Use the "Show reminder to event creator" checkbox to control whether you want to see a reminder for this event. For example, if the event is being delegated, you might not want to see a reminder for it. Use the "Share reminder"' checkbox to enable other people to see the reminder. When checked, two additional options will be displayed for tailoring how the reminder will be shared. To show the reminder to everyone that is sharing the same calendar, select the "Show reminder to everyone" option. To show the reminder to certain people based on their Windows user login name, select the "Show reminder to user names" option. A text box will be displayed where the user names can be entered. Separate the user names with spaces or commas. If you would like a picture to be included in the popup reminder window, check the "Show a picture" box and then select a picture to be included. The path to the picture can either be typed in, or you can select the "..." button to browse for a picture. You can click the drop-down arrow to access a list of recently used pictures. Note that when a picture is displayed, you can also include music with the reminder, but not a video or web page. If you would like a wav file, song, or video to play in the popup reminder window, check the "Play media" box and then select a media file to be included. The path to the media can either be typed in, or you can select the "..." button to browse for a media file. You can click the drop-down arrow to access a list of recently used media files. Supported audio file types end with extensions wav, mp3, and wma. Supported video file types end with extensions wmv and mpg. Note that when a video is selected to display with the reminder, you will be unable to also select a picture or web page. You can control how many times playback of the media file is repeated by using the drop-down list to the right of the media filename. For example, to play the file only once, select the "Play once" option. To repeat playback until the reminder is snoozed or dismissed, select the "Play unlimited" option. When the "Play voice reminder" option is used, a text-to-speech voice will recite the associated reminder text, and repeat the specified number of times or until the reminder is snoozed/dismissed. This can be useful if you're often away from your desk, but within hearing distance. When the reminder appears, the computer will recite the reminder, so you won't need to look at your monitor to find out what the reminder is about. By default, the voice reminder will state the name of the event/task and when it is scheduled to begin. 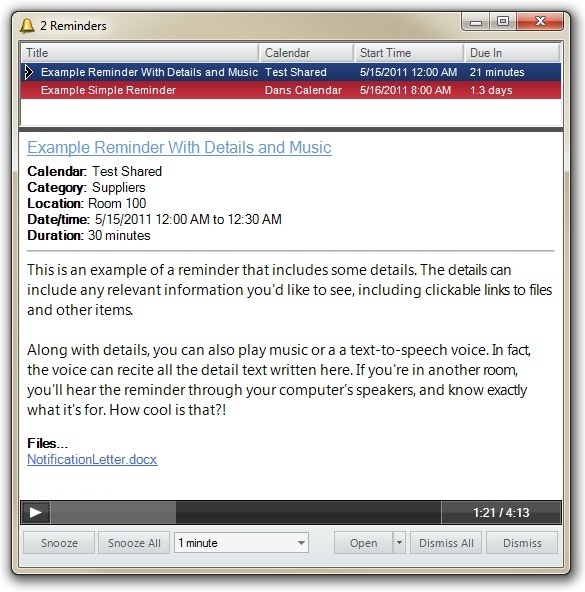 A voice template can be used to customize the recited text. A number of dynamic tags are also provided. For example, when the template includes a tag of [Description], any text entered on the Description tab will be recited. 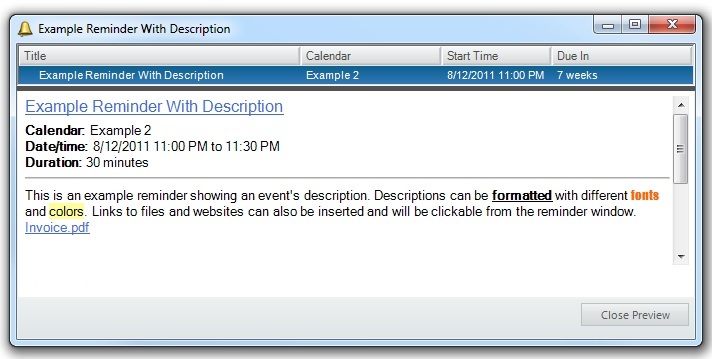 The default template can be specified in the Event Defaults tab of the Calendar Properties window. If you would like to include a web page in the popup reminder window, check the "Display web page" box and then select a URL to be included. The URL can either be typed in, or you can select the "..." button to browse to your Favorites. You can click the drop-down arrow to access a list of recently used URLs. Note that when a web page is selected to display with the reminder, you will be unable to also select a picture. If you would like to include the event description or task details in the popup reminder window, check the "Show the event description" or "Show the task details" box. For events, the text, links, and pictures entered on the Description tab of the Event Editor will be included in the popup reminder window. For tasks, the text, links, and pictures entered on the Details tab of the Task Editor will be included in the popup reminder window. Links entered on the Links tab will be included in the popup reminder window. Files attached on the Files tab will be included in the popup reminder window. You can preview what the popup reminder window will look like by clicking the Preview button. You can use the preview to test that your media files will play or that the web page URL has been correctly entered. An example preview is shown below. In this example, the "Show the event details and links" option was used.